Royal Pack Industries make compact motorized intermittent coder for on-line or table top registered printing of Batch. No., Mfg. Date, Max Retail Price, etc. On any Intermittent From Fill Sealing Machine (FFS) for Oil, Milk, Ghee pouches and on Rigid Containers, Cans etc. Usage/Application CODING ON POUCH , LABELS , CARTON ETC..
Hi- Tech is first company to design and manufacture the most "Compact Design" manufactured so far. It is not only a space saver but also very sturdy. The design ensures trouble free printing with lowest maintenance. 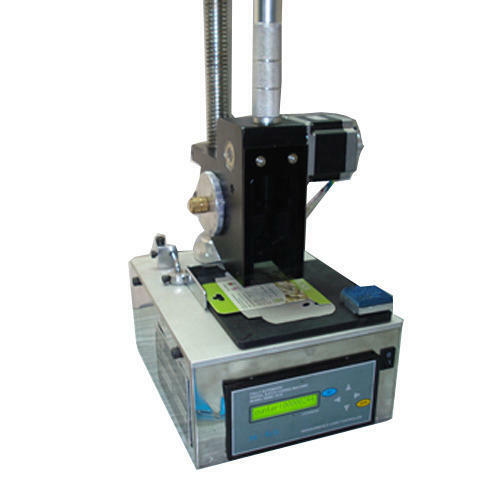 It solves most Batch Printing problem of packing industry by giving maximum output. • Does not require pneumatic compressor for operations. • Specially designed table-top stand for both automatic & semi automatic printing on Tins, Boxes, Labels, Pouches, Bag, and Bottles etc. • Specially designed arrangement for quick and easy mounting on Milk/ Oil/Ghee pouch packing Ind. • In built timer for automatic timed operation or can be connected to a proximity or foot switch for controlled operations. • Imported stepper motor and accessories provide reliability, long life & speed up to 80 Impressions per minute. Printing Speed Max. 80 imprints/min Max. 60 imprints/min. For Imprinting on Pouches Labels & Cartons.